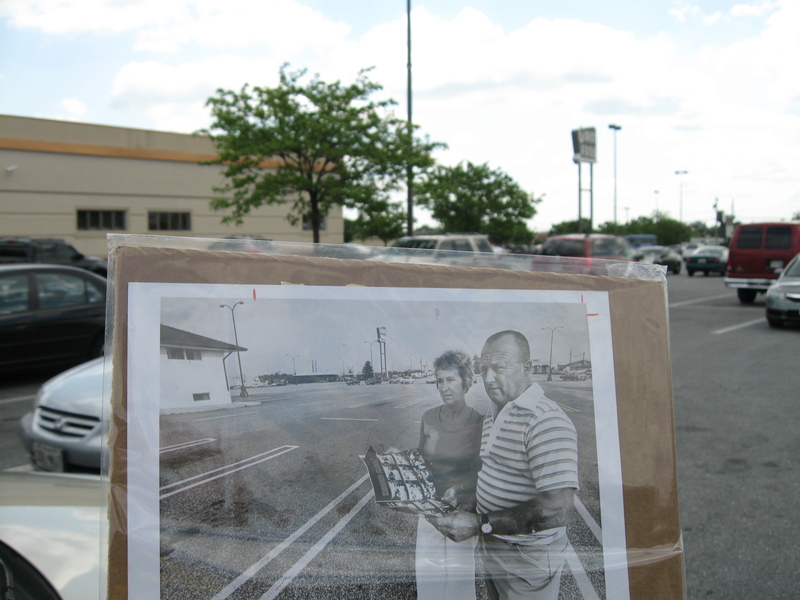 I wasn’t born until December 1972, and my family didn’t move to Laurel until 1976. 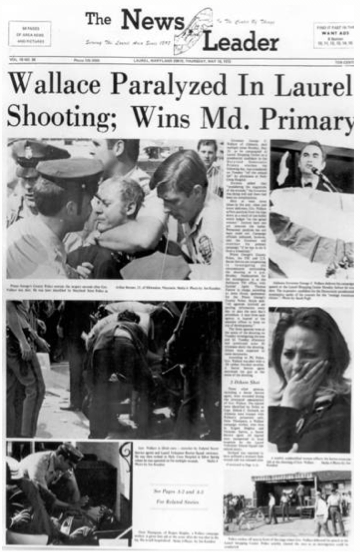 But it wasn’t long afterward that I began to hear about some famous politician having been shot in the parking lot of Laurel Shopping Center on May 15, 1972. Even as a small child, something about that fascinated me—and it has ever since. Our home town was on the map, so to speak, because of this moment of infamy. 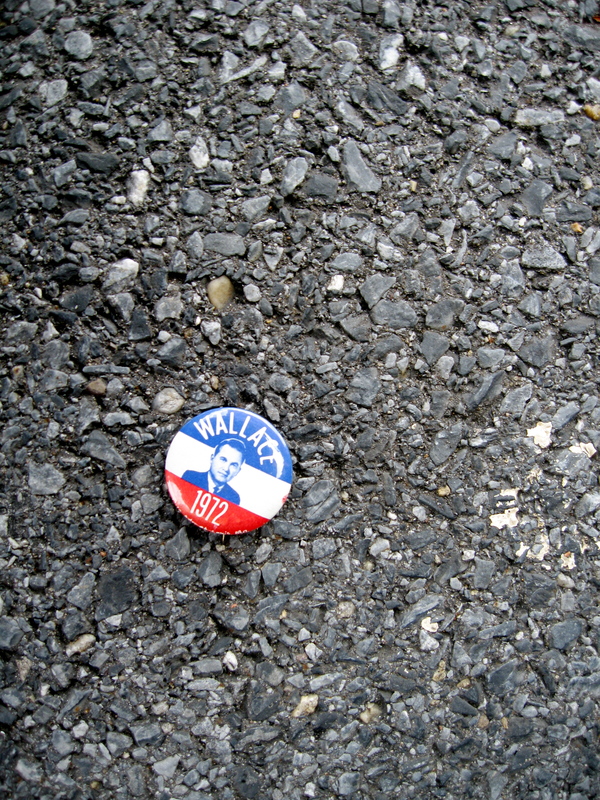 Alabama Governor George C. Wallace—a controversial presidential candidate who would actually win the democratic primary in Maryland that year—had just stepped down from the podium, removed his jacket, and begun glad-handing some of the approximately 1,000 who’d assembled to hear and/or jeer his campaign speech. Within seconds, he’d be gunned down by the proverbial lone nut—a 21-year-old would-be assassin from Milwaukee, Wisconsin named Arthur Bremer. Wallace would survive the shooting, (in spite of a total of five wounds, including shots to the chest and abdomen) but would be confined to a wheelchair and in constant pain for the remaining 26 years of his life. He died in 1998, having spent years renouncing his segregationist past, apologizing, and attempting to rectify a general perception of him as an unvarnished racist—a view he claimed brought him more pain than the assassination attempt itself. Arthur Bremer would spend the next 35 years in a Hagerstown, MD prison before being released (18 years early) in 2007. Now living in Cumberland, he’ll remain on supervised release until 2025. 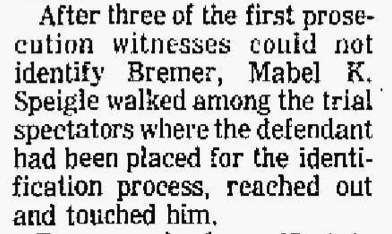 Bremer’s diary, published after his arrest, revealed that the assassination attempt was motivated by a desire for fame, rather than politics, and that President Nixon had also been an earlier target. Bremer’s actions inspired the screenplay for the 1976 movie Taxi Driver, which in turn provoked the 1981 assassination attempt on the life of President Ronald Reagan by John Hinckley, Jr..
Of course, this isn’t a political blog, so I won’t ramble on about Wallace and Bremer’s respective biographies—there’s plenty of information on them out there if you’re interested. 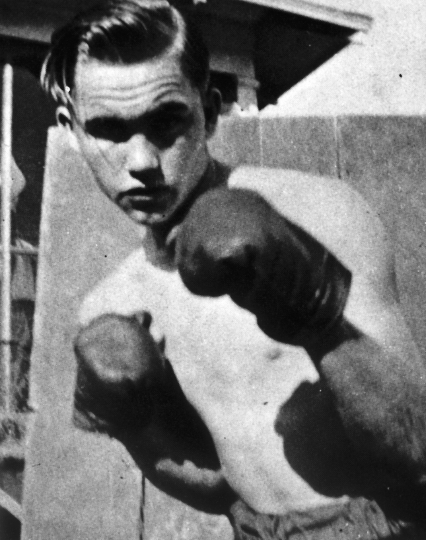 Although as a boxing fan, I will say that I was surprised to learn that George Wallace had been a two-time State Golden Gloves champ. But I digress. 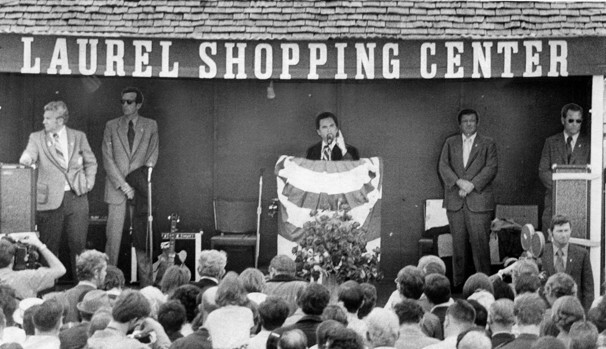 Suffice it to say, I learned at an early age that what had happened at Laurel Shopping Center that afternoon 40 years ago today was a pretty big deal. And it wasn’t just a big deal in Laurel—it had national ramifications. 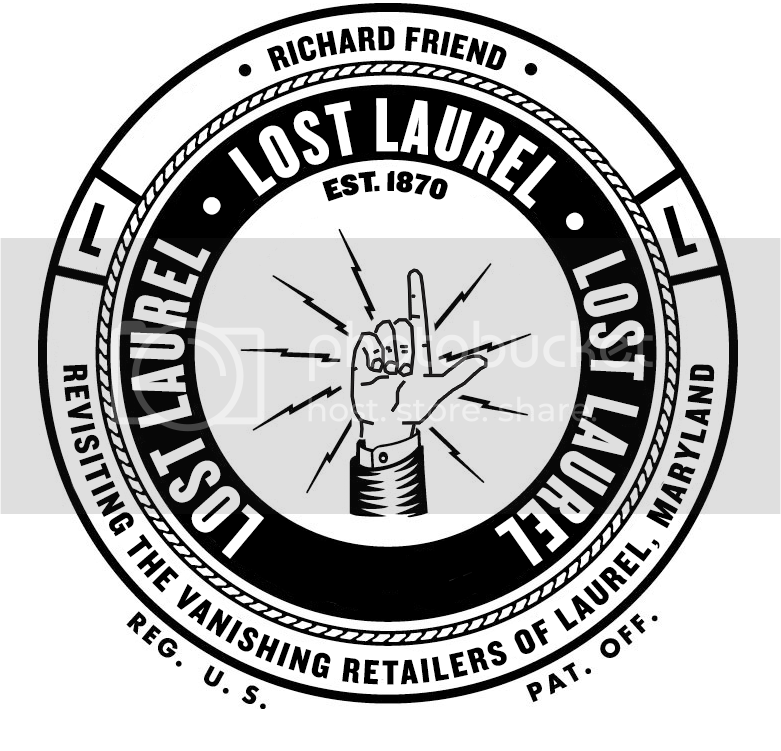 From that point on, it seemed that any and all references to Laurel, Maryland—be it printed in encyclopedias, or in conversation with folks from out of town—inevitably mentioned the Wallace shooting. He was even on a collector’s card! 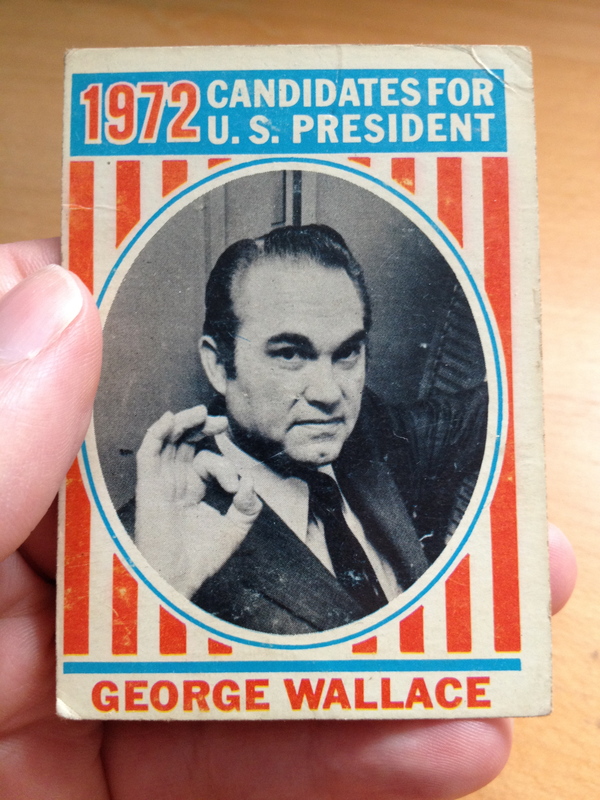 In fact, to this day, an online image search of our fair town will inevitably yield photos of George Wallace (although, more recently, Laurel has also been dubiously tied to the 9/11 hijackers—several of whom stayed here in the days leading up to that tragic day). 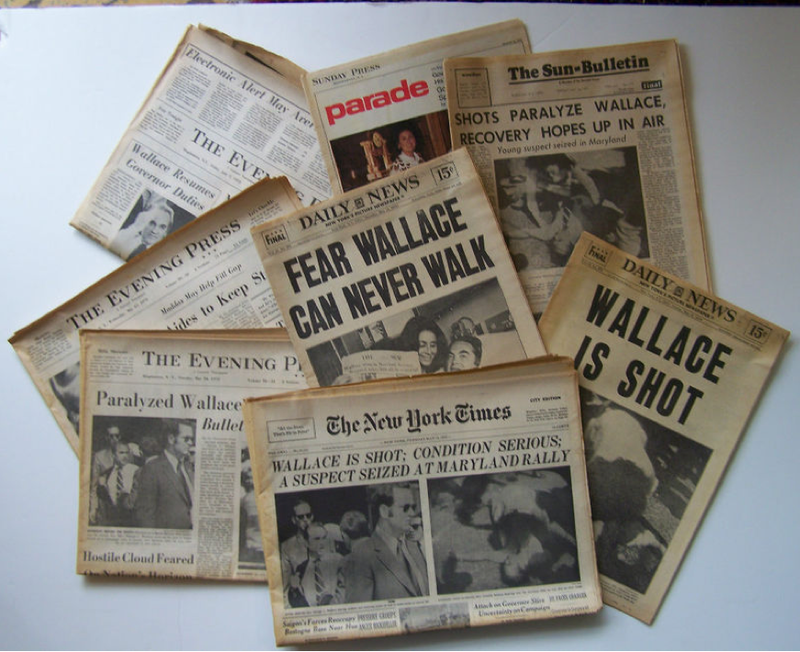 But on this 40th anniversary, let’s look at the Wallace shooting in the context of Lost Laurel, rather than simply recapping the event and its principal players. One of the first questions I had as a kid was, simply, where exactly did the shooting occur? Most of the photos I’ve seen (as well as footage of the shooting itself) are so tightly cropped and non-specific, it’s difficult to discern where in the Laurel Shopping Center this actually happened. My parents, in fact, had long believed that it took place in the Montrose Ave. crosswalk beside Giant Food—probably because the stage Wallace spoke upon resembles the nativity scene that was in that location throughout the 80s. Plus, it seems like a logical place to hold the assembly. However, that was not the case. The stage was actually set closer to the center of the parking lot, just behind what was at that time the Equitable Trust Bank, (currently Bank of America). It was in this area of the parking lot—between the south side of the bank and Woolworth’s—that Governor Wallace was shot. The photos below, courtesy of John Floyd II, show the back (south side) of the bank—where the shooting took place. 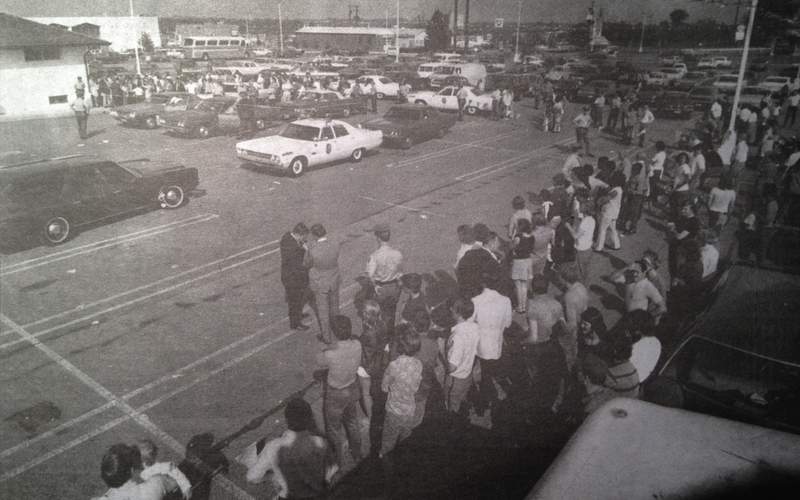 John, 14 years old at the time, was there that day with his mother, and estimates the actual spot of the shooting to be approximately where the white car is parked in this photo. You’ve probably noticed the name “State Bank” on the photo above. That’s what it was before it became Equitable Trust. (Hmm… banks constantly changing names—some things weren’t so different 40 years ago after all, were they?) 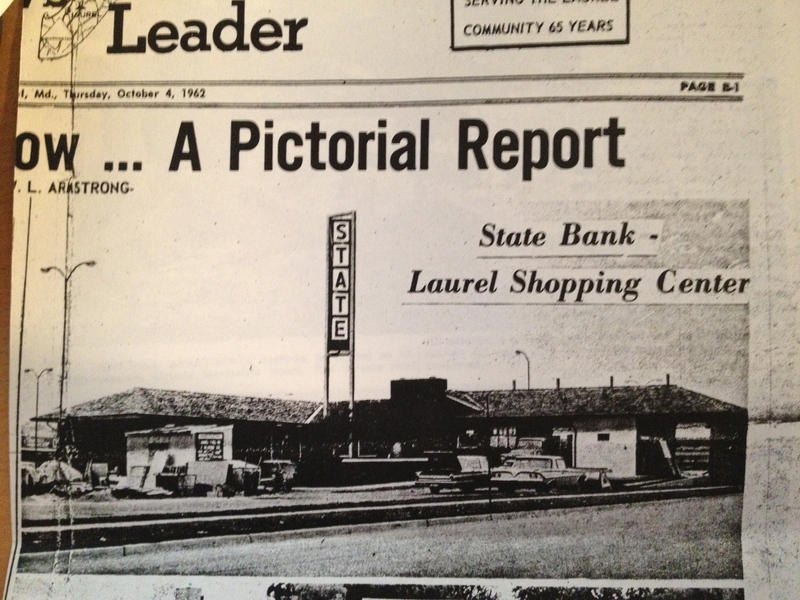 Below is a Laurel News Leader cover photo from October 1962, which announced a $60,000 construction and improvement program to the State Bank’s Laurel Shopping Center branch, including an enlargement of the lobby and two new executive offices, a fall-out shelter in the basement, complete new heating and air-conditioning plants, as well as decorating and landscaping. 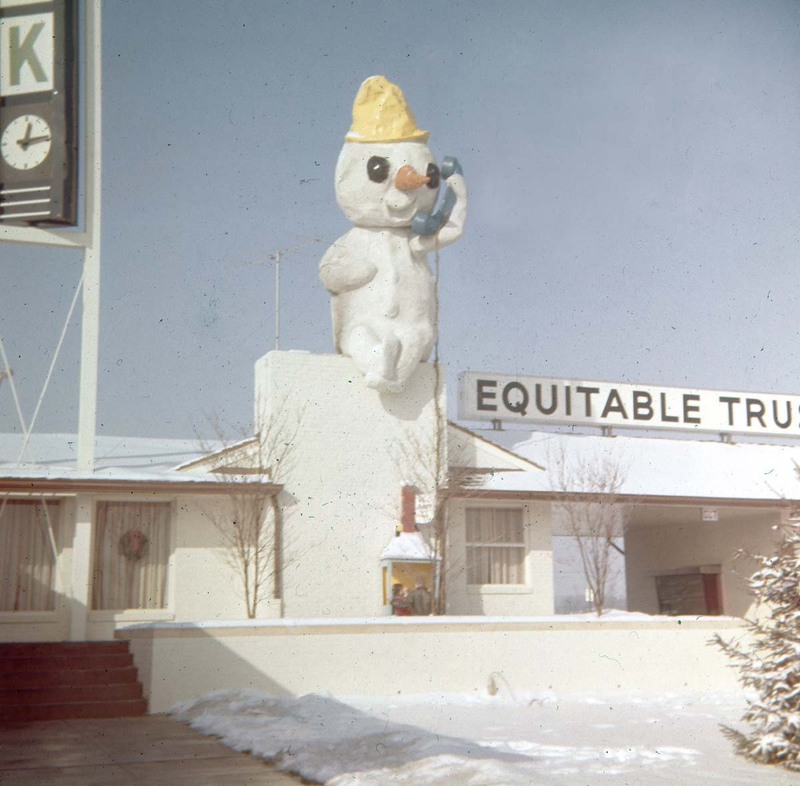 A 35mm color slide from an undated winter during the bank’s Equitable Trust era gives us a peek at the front of the building; although it’s somewhat difficult to focus on anything other than the massive, lumpy, telephone-wielding snowman perched atop the bank. During this phase, the bank had been painted white. We can also see the addition of a clock in the lower portion of the large, vertical sign—the lettering of which was also obviously changed. (I’m assuming it simply said “BANK”). 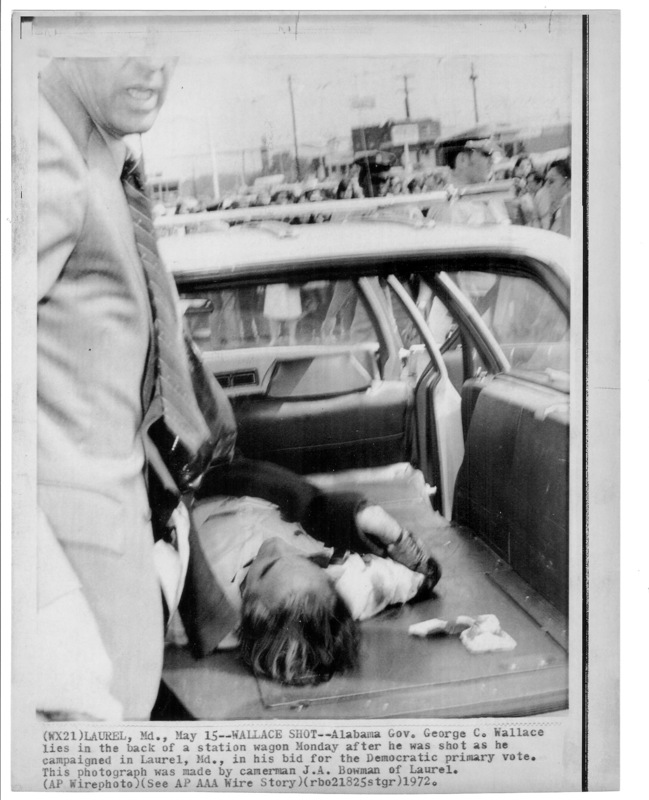 The file photo below shows the aftermath of the shooting—just after Wallace had been whisked away by ambulance. (John Floyd noted that prior to the assassination attempt, the entire parking lot between the bank and Woolworth’s was packed with spectators). In the photo, we also have a distant glimpse of some of the other businesses that were there at the time—most notably, Hecht’s in the top left corner behind the bank; the original International House of Pancakes, with its gabled roof; the Laurel Car Wash (originally owned by former Laurel Mayor Harry Hardingham, and still in business today! ); a BP gas station; and a Fotomat booth. 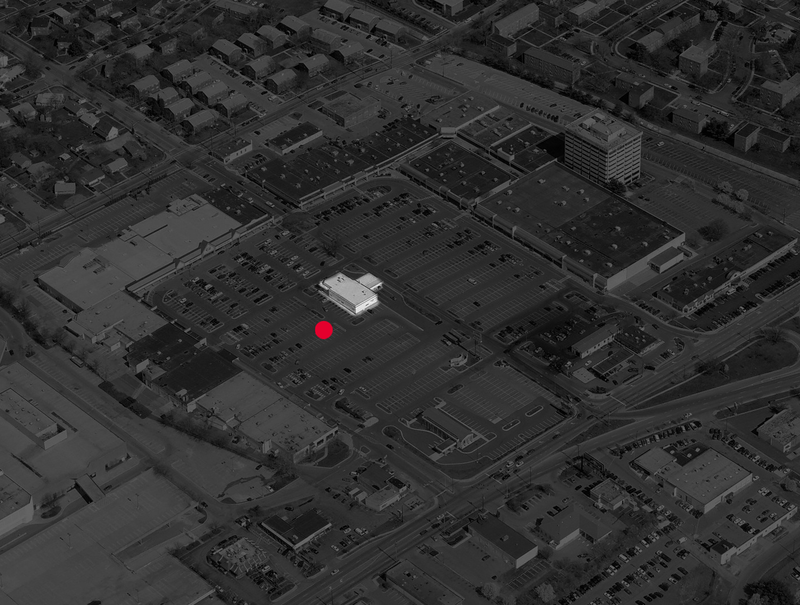 To that point, let’s look at what else comprised Laurel Shopping Center at that time. 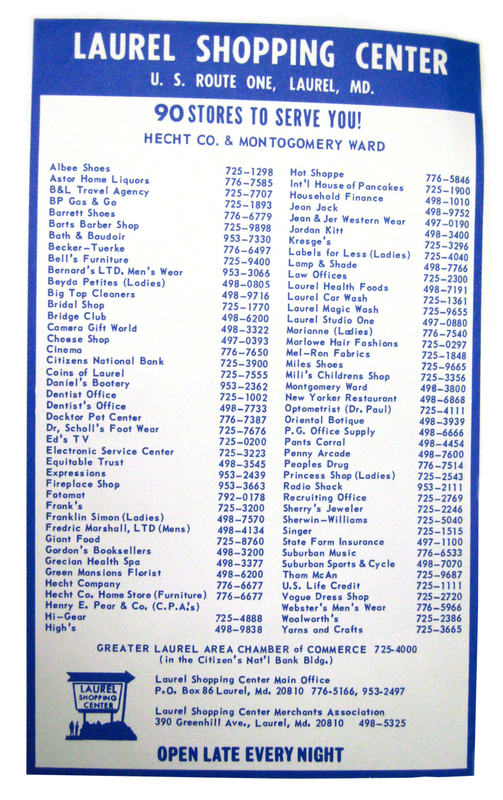 The following directory came out a few years later, but many of the businesses listed had been open at the time of the shooting. Another view of the shopping center from this era comes from an apparent protest of, well, pants. 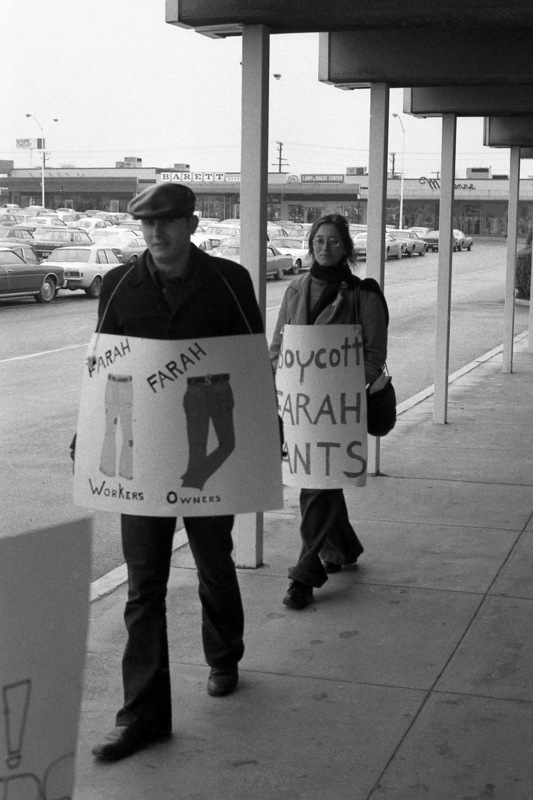 This demonstration, apparently calling for the boycott of Farah Pants at Hecht’s, occurred in December 1973. It’s also worth noting that one of the more dramatic photos that came across the AP Wire—showing a motionless Wallace lying in the back of a station wagon while awaiting an ambulance—was taken by a Laurel photographer, J.A. Bowman. 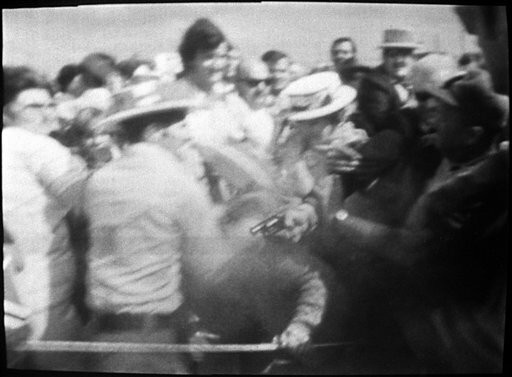 Recently, I found a photo that appeared in the October 16, 1977 issue of the Washington Post, recalling the shooting five years later. The article featured Mabel and Ross Speigle, between whom the would-be assassin literally reached while firing. Ross was the gentleman in the ball cap, whose tattooed arm you can see grabbing Bremer’s arm. The couple recalled their incredible experience, and were photographed in the spot where it all happened. Given this significant anniversary, I thought it only fitting that Mabel and Ross accompany me (in a manner of speaking) back to the site one more time. There’s at least one other camera angle showing the Wallace shooting—this one with a brief glimpse of the Equitable Trust Bank itself, giving the surroundings more context. In this particular upload (set to Lynyrd Skynyrd’s Sweet Home Alabama) the footage doesn’t begin in earnest until the 1:34 mark. However, it’s in color; and it has sound. You can easily get a sense of the chaos in the immediate aftermath on that incredible day. And lastly, there was a film made about the life of George Wallace. It’s titled, (you guessed it) George Wallace. Gary Sinise starred in the title role, alongside Angelina Jolie as his then-wife, Cornelia. The filmmakers did a decent job recreating the “Laurel Shopping Center” stage from which Wallace spoke before the shooting, but anyone who’s familiar with Laurel will immediately notice the surroundings and realize that the scene wasn’t shot (no pun intended) at Laurel Shopping Center. Interestingly enough, Gary Sinise won an Emmy for the performance—on the very night that the real George Wallace passed away. I was there that day. I got off high school to go. Very informative article. I remember the fellow on the load speaker you can hear in the video. BTW: Stephen King mentions the situation in the Dead Zone – and the Secret Service Men were thinking Laurel, MD, Laurel, MD. Thanks. Thanks. I was there that day. I got off High School and 2 of my friends went with me. We were leaving and then it was announced that Mr. Wallace was going to shake hands (he’d been behind bullet-proof glass) so we were headed in his direction when all hell broke loose. I was pretty close, but I don’t remember hearing the shots. The video captured the chaos pretty well. I appreciate all the research you did. BTW: In Stephen King’s the Dead Zone he references secret service agents thinking-Laurel, MD, Laurel, MD. Sent shivers through me when I read that. 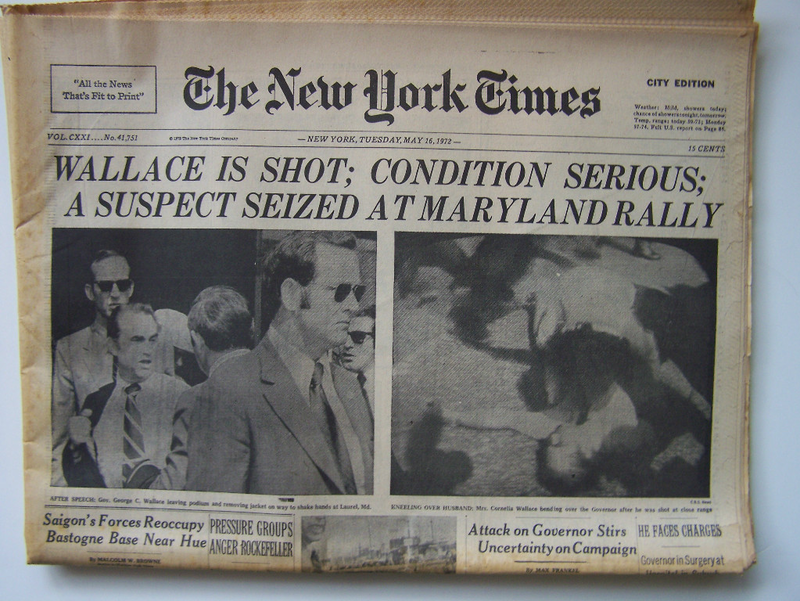 Former Press Secretary, Bill Jones, got into an argument with Wallace regarding safety the day before he was shot. Bill stressed the importance of staying behind the bullet-proof glass and wearing his bullet proof vest. But it was a hot day and Wallace did not heed his warning that fateful day that left Wallace in a wheelchair the rest of his life. I was working at the Fotomat that day and a man from UPI came over to use my phone to call in the story. I remember seeing the helicopter land and saw the amulance drive away. Do you remember seeing anything or anyone unusual that day? Like a second shooter(s)? My Dad took that picture that ended up on the cover of LIFE magazine. I wasn’t even born then; my mom was pregnant with me at the time. Is your dad still alive Hannah? Nope. He passed away in 1998. The protest against Farah was not against pants but against the sweatshop like working conditions and wages paid to primarily Latino workers who were trying to unionize. It was part of an international campaign to pressure Farah. Are there any plans for a monument of some kind where the shooting took place? I know Governor Wallace didn’t want one, but it would still be a nice tribute. I agree that the Wallace shooting fascinates me as well! I was born in 1975,so obviously I wasn’t even alive when it happened,but I’ve read a lot of different books and news articles and so forth about it. I live in Bear Delaware and having been wanting to travel to Laurel MD and checkout out the shopping center and checkout and stand in the spot where he got shot and laid on the ground. Because it was so long ago I wonder if a lot of people even know about the shooting. I know younger people probably don’t and could care less about,I would like to here more about it! I don’t know if it is famous part history to warrant a documentary about it,but I think it would be cool if somebody could do a documentary on it,the shooting its self and the days and hours leading up to it! I’m sure as the more years go by the the more it fades into history and is forgotten about it. I would love to.learn more about it! 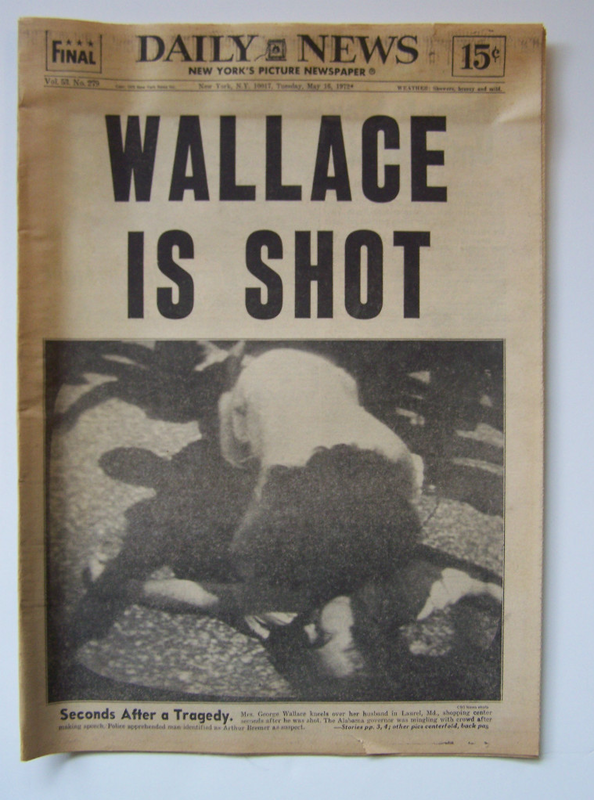 As I just posted, I was there at the rally when Wallace was shot. As I said” you couldn’t help but feel ashamed that a person was shot on our watch in our town.” You honestly from where we were didn’t know what happened, until secret service were trampling us to get control of the shooter. I hear he was released in 2008-09? Lives in Cumberland Md. I thinks that’s a crime in itself . Arthur Bremer was released from prison in 2007. He should have been in prison for the rest of his life! If the shooting happened in Texas he would’ve have been put to death lol. I was there end of school year for civics’ class… I was approx 2 rows back from the shooter off to his right. I remember hearing what we thought was a car backfire, and all of a sudden we were trampled by secret service agents… I remember them yelling to all of us “stay down!”.It was an awful day in Laurel Md. ; you couldn’t help but feel ashamed that a person was shot on our watch… Afterwards , my father was so mad I went to the rally I don’t know what was worse, disappointing him or being trampled by agents. Our cameras were also confiscated, that’s how they got a great deal of evidence. This was told to us by a friend who was secret service. He was released from Prison in 2007 Arthur Bremer. What is really bad he never showed any remorse for what he did. I can’t believe he was released from Prison. He has been asked many times over the years for interviews and he refuses. 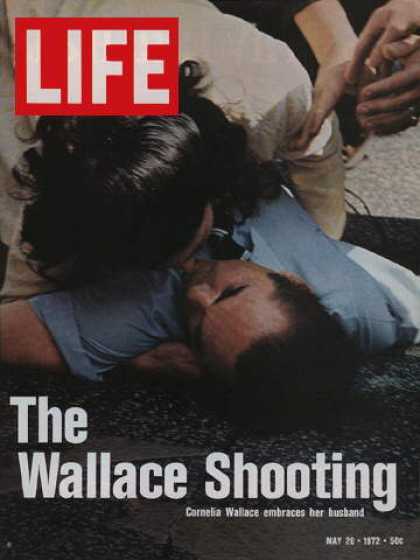 Younger people and really most of the public has forgotten about the shooting Arthur Bremer and George Wallace. 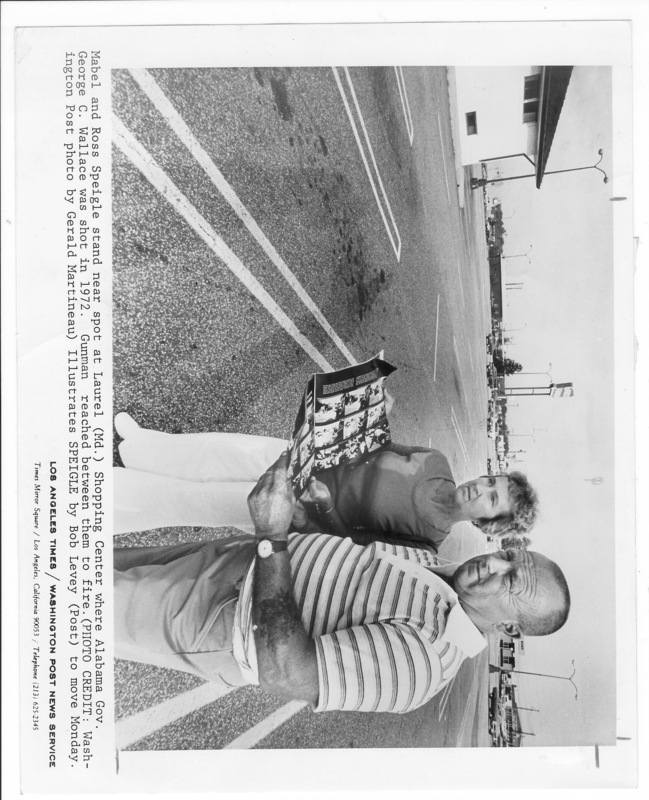 I wonder if a lot of younger people in Laurel even know about the assassination and that is happened in the Laurel Shopping center or they even care to know. I think as the years go by its fades and gets lost in history. Most younger probably don’t even know who George Wallace was. I also believe that Richard Nixon was behind the assassination as well. My Husband and his father were in the crowd when Wallace was shot. His father owned Ed’s TV in the Laurel shopping Center. Thank you for taking the time to put this all together. In the 30 years I have lived in this area, I’ve often wondered where exactly the shooting happened. When visiting the Giant or eye doctor in this shopping center I know that barely anyone knows the history. Keep history alive. The more we know and remember, the better off civilization is. I was wondering what is on Wallace’s right arm. It’s in the pic of him in the Station wagon,also what is the white material all around his body. It’s hard to tell what those things are in the photo. I was wondering what that thing is on Wallace’s right arm and what is the white material all over his body/torso? I’m referring to the pic of Wallace in the back of the Station Wagon. It’s hard to tell what those two things are in the picture. Just curious. Anybody know? Oh ok. Yeah it does look like gauze. But what that thing around his right arm. I was at the Laurel Shopping Center yesterday where I encountered something bizarre. I was standing outside the haunted house (which took over the movie theater’s former location) while I was hearing Christmas music being played over the public address system. This music was playing despite the fact that Halloween had just happened the day before, yesterday was the first day of the two-day Mexican Day of the Dead holiday, and Thanksgiving Day isn’t scheduled to arrive for another four weeks. I shot a short video showing what it was like. Talk about a major case of cognitive dissonance! I would really like to put a full length documentary together about that day in Laurel Maryland and the months and days leading up to it. A real documentary. The whole incident has always fascinated me. Get I interviews from all the people involved from his campaign and local people that we’re there that day and try to find people that are still alive from that era! I think it could be very good. I’m sure it will be very hard for me to find people that might be interested in helping me out with it. If there is anybody please let me know thank you. My name is Russell knapp … I was there twenty feet away from shooting. I was raised in laurel. Parents owned Knapp’s store on Main Street. Lot off younger have no ideas off these parts off laurel history. I got quoted by Baltimore sun paper, and the London Times. They phones in town were actually shut off after the incident. For a few hours. I have a foam hat with Wallace for president, signed by George Wallace from the day off the shooting.